The Los Angeles Lakers superstar pulled off the incredible yet somewhat expected feat in a win over the Portland Trail Blazers, 126-117, their fourth straight. LeBron dropped 44 points—the most by a Laker since Kobe's farewell 60—on 13-of-19 shooting from the field, and 5-of-6 from beyond the arc. He also had 10 rebounds and three blocks, while falling just an assist shy of a triple-double. Prior to his explosion, LeBron was averaging 26.4 points in his first 13 games. But all he really needs to do is score is at least 25 in each of the next 40 outings to catch up to the next man on the list: Michael Jordan, with 32,292. 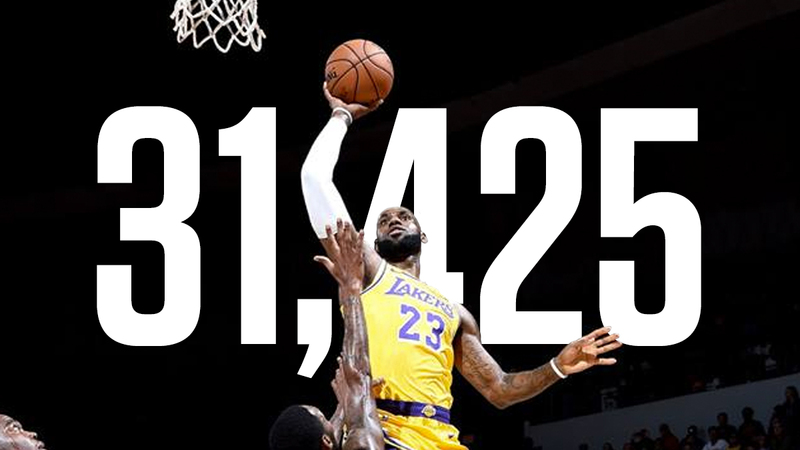 Bron will surely make his case for greatest of all-time stronger vs MJ with another milestone. The manner in which LeBron passed Wilt was rather symbolic, considering the nitpicking of his recent shooting woes from free-throw line, especially in the clutch. He flipped the script that night and went 13-of-15 from the charity stripe. Interestingly enough, the Stilt was an even worse career foul shooter at 51.1 percent.